Cameronbridge – one of the few grain distilleries in the Highlands – produces mostly for the blenders. J&B, Bell’s, Johnnie Walker, Vat 69, White Horse… they are all customers. But from time to time you can taste it as a single grain, like this one from Douglas Laing bottled after 26 years of maturation. 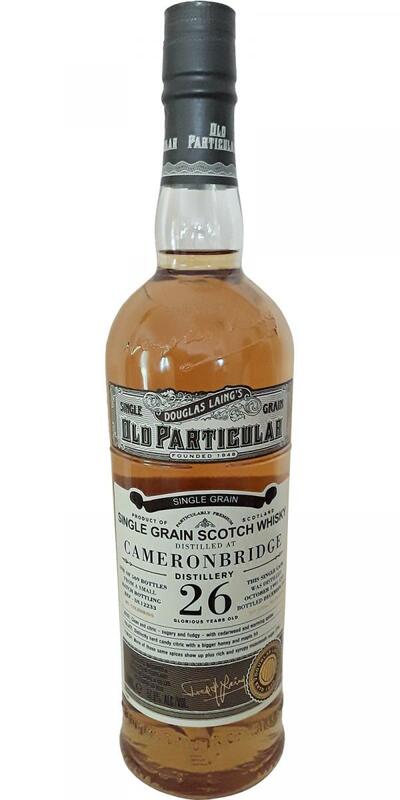 Douglas Laing has bottled no less than 7 sister casks of Cameronbridge 1991, all in their Old Particular range. The nose starts very closed. I need quite a bit of hand warmth and a lot of patience to get it to talk. Some marshmallow, vanilla, wood shavings and oranges slowly appear. But in all honesty, this grain offers little more, making it somewhat boring. It is very spicy and creamy. You can almost chew this whisky. Quasi syrupy. The spices are mostly white pepper, liquoirice and some ginger and nutmeg. Fruit? Oranges and coconut with a hint of hard pears. Much better than the nose promised. From the second sip forward, it even turns candy-like sweet. The finish is very long, peppery and somewhat drying. After the silent nose, the palate made up for things. Around 70 EUR.